Requirements were REVISED effective January 1, 2004. 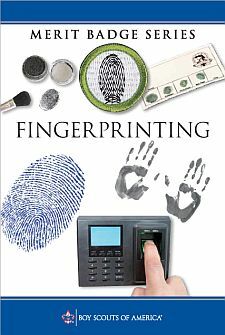 Give a short history of fingerprinting. Tell the difference between civil and criminal identification. Explain the difference between the automated fingerprint identification systems (AFIS) now used by some law enforcement agencies and the biometric fingerprint systems used to control access to places like buildings, airports, and computer rooms. Name the surfaces of the body where friction or papillary ridges are found. Name the two basic principles supporting the science of fingerprints and give a brief explanation of each principle. Explain what it takes to positively identify a person using fingerprints. Make both rolled and plain impressions. Make these on an 8-by-8-inch fingerprint identification card available from your local police department or counselor. Using clear adhesive tape, a pencil, and plain paper, record your own fingerprints or those of another person. Show your merit badge counselor you can identify the three basic types of fingerprint patterns and their subcategories. Using your own hand, identify the types of patterns you see.